Yaskawa Motion - Techmaster Inc.
Yaskawa America, Inc. – Drives & Motion Division is a U.S. corporation, created to provide Automation Solutions and Support to our customers in North America, Central America, and South America. Yaskawa is the world’s largest manufacturer of AC Inverter Drives, Servo and Motion Control, and Robotics Automation Systems. Products are marketed through direct sales, partners, representatives, dealers, and distributors. Yaskawa America, Inc. – Drives & Motion Division is a wholly-owned corporation of Yaskawa Electric Corporation of Japan. Since 1915, Yaskawa Electric has served the world needs for products to improve global productivity through Automation. The flexible design of Yaskawa machine controllers allows cost-effective configuration of motion control for any sized automation system. Controllers can be easily adapted for stand-alone use on a single axis, for networking with other control devices or for complete control of a multi-axis machine. If the controller you need is not listed below, view our other machine controllers or other PLC controllers, which includes legacy products. 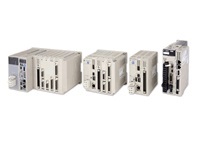 Sigma-7 products set a new industry standard in servo capability, with features that advance Yaskawa’s 25-year reputation for redefining the possibilities in motion automation. If the servo product you need is not listed below, view our other servo amplifiers or other servo motors, which includes legacy products. The motion engine of MPiec controllers incorporates IEC61131-3 and PLCopen programming standards, offering users motion control options from a single axis to as many as 62. Match any Yaskawa servo motor with a fully digital, easily networked SERVOPACK amplifier. The productivity features within each SERVOPACK enable more precise control and shorter settling times. Each model is equipped with a package of software algorithms that tune automatically, suppress vibration, and compensate for friction and ripple and effects. Choose from single or dual axis designs. Yaskawa offers both MECHATROLINK and EtherNet/IP remote IOs that are supported by MotionWorks IEC. Other fieldbus IOs are also available. Smooth rotary motion is the hallmark of the SGMCS servo motor, which features a direct drive design in which a load is directly attached to the motor surface. 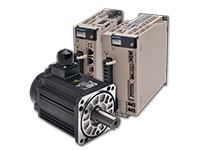 In terms of compact size, high resolution and precise performance, the automation industry has never seen a line of rotary servo motors like today’s Sigma-7. The full range of products from 3w to 55kw perform in higher temperature extremes, at higher altitudes and in more washdown environments than ever before. Every Sigma-7 model is backward compatible with existing Sigma-5 and Sigma II products. Yaskawa linear servo motors replace the backlash, friction, inertia and wear of mechanical linkages with smooth, precise, high performance linear motion in a compact footprint. Yaskawa non-IEC controller options offer up to 256 axes of motion control, programmable using MotionWorks v5 or v6 software. MotionWorks IEC offers intuitive, powerful programming capabilities within a familiar IEC61131-3 environment, and OPC Server allows easy data exchange between PCs and MPiec controllers. Select, set up and tune any Sigma-7 servo system with Yaskawa’s family of user friendly, field-proven PC software tools.